Compatible with all the Somfy RTS motors. Controls one window covering or one group of coverings. The clean pure white finish offers a classic look for any décor. 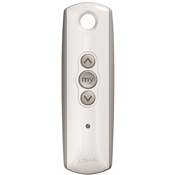 Single channel hand-held remote provides control of either one individual motorized application or one group of motorized applications. Radio Technology Somfy® (RTS) provides compatibility with full range of RTS controls and accessories and allows operation of motorized applications within a range of 65 feet.